The bust of Second Lt Radha Mohan Naresh , the first alumnus of SSKZM to make the supreme sacrifice for the country, was unveiled by Mr. KC Venugopal, Minister of State for Power, on 10 December 2011, on the 40th death anniversary of our martyr. Here is the coverage by Malayala Manorama on the events of the day. From the New Indian Express. Finally, a memorial for Radha Mohan Naresh. THIRUVANANTHAPURAM: The Sainik School, Kazhakkoottam, has finally got a memorial for Second Lieutenant Radha Mohan Naresh, an alumnus of the school, exactly four decades after he laid down his life fighting the enemy. Minister of State for Power K C Venugopal unveiled the bust of Radha Mohan Naresh on Saturday. Radha Mohan, who belonged to the 9 JAT Regiment, died fighting the enemy at Rajpur Crossing across Munawar Tawi River, on December 10, 1971. He belonged to the 1967 batch of Sainik School, Kazhakkoottam. Radha Mohan was the first alumnus of the Sainik School, Kazhakkoottam, to lay down his life fighting the enemy. The bust was unveiled in the presence of Radha Mohanâ€™s mother Subhadramma and his brothers Dr Gopi Mohan Naresh and Praveen. 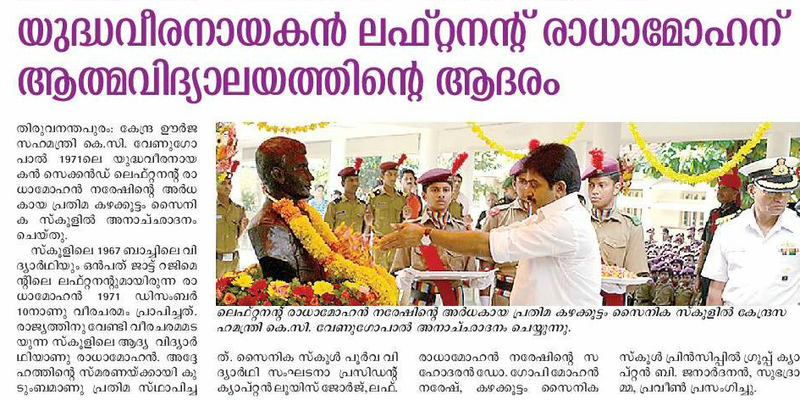 K C Venugopal exhorted the cadets of the school to emulate the young hero and grow to love the nation. Capt Louis George, president, Old Boys Association, Sainik School principal Group Captain B Janardhanan, old boys of the school and cadets were also present. The school has memorials for alumni Col N J Nair and Capt R Harshan who died fighting insurgents in the north-east and Jammu and Kashmir respectively. Read as it originally appeared in the New Indian Express here. ← The Batch of 1983 pays Tribute.